Enter your photograph and you could win cash prizes! This category also includes, the acequia landscape that show off your farm or ranch, including but not limited to scenic photos of your crops and/or animals, or photos of family working in the field. This is an opportunity to showcase your artistic ability in manipulating imagery through apps and programs like photoshop. This category allows you to create creative shots, colors, and style of your favorite photos or drawings related to your acequias, culture, and the other categories. Participants are limited to one photo per category. Thank you so much for your contributions to your local acequia. The New Mexico Acequia Association is conducting a statewide acequia needs assessment and we need your participation. The New Mexico Acequia Association is a non-profit statewide organization of Acequias and Regional Association of Acequias. Our mission is to protect historic acequia water rights and strengthen agricultural traditions. We are requesting your voluntary participation in filling out that attached Acequia Survey. Acequias are defined as local governments and the information requested is considered public information which would be shared with the state of New Mexico. Your participation supports acequias across the state. Please note that every year we change and update many of the questions. Please respond by December 11th at the latest. Call the NMAA office: You can dictate your responses to staff and be done! Paper survey: Complete the enclosed survey and mail, fax or scan it back to us. The Gila acequias are lucky to have Linda Stailey as their unofficial spokeswomen. These Acequias were completely off the radar of NMAA until the late summer of 2016 – but NMAA couldn’t be happier having made their acquaintance. NMAA made a visita to the Gila and then they came up to our Congreso in Taos. While our acequias across the state are diverse, it is striking the passion and dedication that we have as land-based people for the water and community, as we are bonded by our deep inclination to defend and protect this way of life. What is the history of your acequia, as you know it (or as you’ve been told)? The original charter for the Fort West Ditch was issued in 1875. There were about 12-15 irrigators who proposed the charter, signed it and filed with the treasurer of the territory – in Santa Fe. Fort West Ditch, Gila Farm Ditch, and the Upper Gila Ditch are the only acequias still in operation in the valley, but at one time as many as 10 ditches in operation. The men who signed the Fort West charter had lands on some of the other diches. The area was settled by Mormons early on, and they brought irrigation practices from Utah that had been successful there in the mid 1850s. The original irrigators were Maldonados (still on the acequia) and Guerreros, the other 50% was primarily anglo. The acequias still have minutes going back to the 1920s. It was in the last 12 years that we organized a regional, the Gila Basin Irrigation Commission, around the AZ settlement act which we see having long lasting impacts on acequias. What kinds of crops does your acequia community grow? Primarily alfalfa, permanent pasture, a few small irrigators have home gardens, one irrigator in the valley is very involved in the Silver City farmers market. What is grown is mostly for local consumption. Three wire bales is about as big as we can manage about 60-80 lbs a piece. We buy new equipment to keep older equipment going . . . and every piece of metal has a story. Before the Regional, we were not really communicating with other ditches, but we have learned to coordinate repairs to reduce transport costs of equipment. Our Ditch is about 13-15 miles long. We used to have an annual cleaning – in our original charter there was a section outlining the kinds of equipment recognized and how labor would be valued, a Fresno, 2 boys and four horses could work off entire assessment – a shovel and one man, could not work off as much. . . now we have a fellow in the valley with a track hoe, he cleans the ditch and sends us a bill. It’s easier and faster. We always have problems over right-of-way – tractor guys is not a landscaper – but we let folks know they have to move the mud if they don’t like it. It is difficult that so many pieces of property have been sold and the water rights sold to someone else –and people just don’t understand the importance of easements. A lawyer once told us to respond to those who want to move the ditch with: “you’ll come closer to asking God to change the length of day than to move a ditch”. The water will run year round if we have a need for it and if there is water in the river. There are times when the river goes dry and when there is not enough for the 3 ditches – then we create a schedule to share. Fort West catches a lot of the Gila Farm Ditch wastewater, this helps a lot . . . We meet the end of January / early February and have– water in by the first of April. Sometimes we irrigate into October – first frost is in November. In the high desert we usually get 6 inches of rain per year, this year we just got 6 inches in August . . .
Not much this time of year – most of our work is in the spring. We don’t anticipate other meetings unless we have a major high water event and we need to get together and discuss repairs. Right now folks are sitting back and enjoying the green hills, and full water tanks. Big high water events are usually in winter months that can damage diversions. Gila farm ditch is working with engineers to design a permanent diversion structure. At any given time we can have a 100 year flood, we can have 100 year flood every 5 years. But we can only take water during high water events. The San Francisco River can also be flooding at the same time below Clifton, then Commissioners come together. This is when commissioners call a special meeting to discuss repairs – we usually wait until the worst of the winter weather is over. We have repaired a diversion and had it washed out the next month. I can tell you what I have told critics of the settlement – historically and culturally. This valley has fed the entire SW corner of NM, including Catron, Grants, Luna and Hidalgo Counties. If we did not have the water here this community, this country would dry up and blow away. We are fortunate to have the ditches maintained as well as they are to have the water when they need it. My husband’s family used to deliver food to Conservation Corp camps, they had a dairy and a truck farm – that is how they survived. Our kids had milk cows age 7 through high school. Our daughter bought her first car and paid college tuition with her milk money. When we find someplace better to go we’ll move, but money can’t buy this – this is home. This history, the culture, it’s priceless. Our youngest son just moved back . . . families are moving back to the valley. When the water came back the number of irrigators doubled. We are nowhere near dead. Other people would have you think this valley has had it, but no way – we’re here. But if we didn’t have the water it would not be possible. I have a view of the Mogollon mountain range from the far west end to just about the head waters of the Gila river. That mountain range is what feeds our river, river feeds ditches, and our ditches feed the valley. It’s important that the water stays in this valley. our democratic institutions and important decisions are made here. So let’s get it right. Regardless of being an expert at Roberts Rules or a novice to community meetings there are some steps you can take to achieve your goals of holding transparent, productive meetings that comply with state statute and why does state statute matter? Because acequias are political subdivisions of the state, local governments (I know you knew that already, but it is my job to repeat this whenever I can). Like calibrating your oven to ensure things cook evenly and at the right temperature, adopt the Open Meetings Act Resolution. This will support the acequia in being prepared with the right ingredients. See our webpage or contact the office for the template and guidance. Like a good sourdough this takes some preparation. The Commission should create an agenda including any topics that need to be voted on, this is your guide to what you want to accomplish, get input on controversial issues, approve changes to bylaws, get buy-in for a new infrastructure project etc. Any items added at the meeting (by a vote of members eligible to vote) can be discussed but NOT voted on. Letting the dough rise. The agenda must be posted (in accordance with bylaws and the Open Meetings Act). This means, at a minimum, posting in a public place – often at the local post office 10 days in advance of the meeting. The commission may opt, or your bylaws may direct you to snail mail email or call parciantes to give them notice (if the acequia has a website you MUST also post there). You can always go above and beyond what the bylaws call for, like adding shredded coconut or rosemary when it’s not called for (yum). This means a majority of parciantes according to your bylaws – this could mean only counting those members current with their dues (this can be like sorting beans – you don’t have to count the non-conforming ones). Also, only 1 person is counted per household (or co-tenancy). Quorum could be tallied using proportional votes based on acreage, or one vote per parciante – again, see your bylaws and/or call NMAA if you have questions. OJO: the public – anyone can attend the meeting and have comments – but do not count towards quorum, only members can vote. If you cannot obtain a quorum you can still discuss the agenda without voting on items. You could also re-post the meeting and do more outreach, or you may need to revise your bylaws to determine an attainable quorum. You may find this to be a very special ingredient that acts differently according to altitude/attitude. Let’s all be on our best behavior and listen to each other – at the end of the day this is what most of us want, to be heard. The acequia has the right to conduct business and no one should obstruct or disrupt that. Many people are not accustomed to formal meetings and need to be open to learning and kindly being coached on the norms and practices of the acequia. All parciantes can model this. This is the sugar that makes the medicine go down. – Consider sprinkling some celebration in your meeting, food, music, social time . . .
– Do you have special traditions that could be revived? Could a meeting be paired with a celebration of el Primer Agua or something else that engages youth and families? – Can you make time to ask bigger picture questions? – Is there a guest speaker who would add useful information or inspiration to the meeting? – Can you invite local youth to share about their relationship with the acequia? – Any room for forgiveness? Any grudges we can let go of? Hugs that can be shared rather than withheld? Regardless of how past meetings have gone – or what you envision for future meetings of the acequia, NMAA is here to offer technical support and advice to achieving meetings that bring life to the community and support the acequia in moving forward – because before and after the meeting there is a whole lotta work to do, in our fields, families and along the bordos. Good luck and God bless! We hope it turns out delicious. Water is Life: Gathering for Mother Earth! For all cultures and ages! Join the NM Acequia Association in the 18th Annual Congreso de las Acequias! 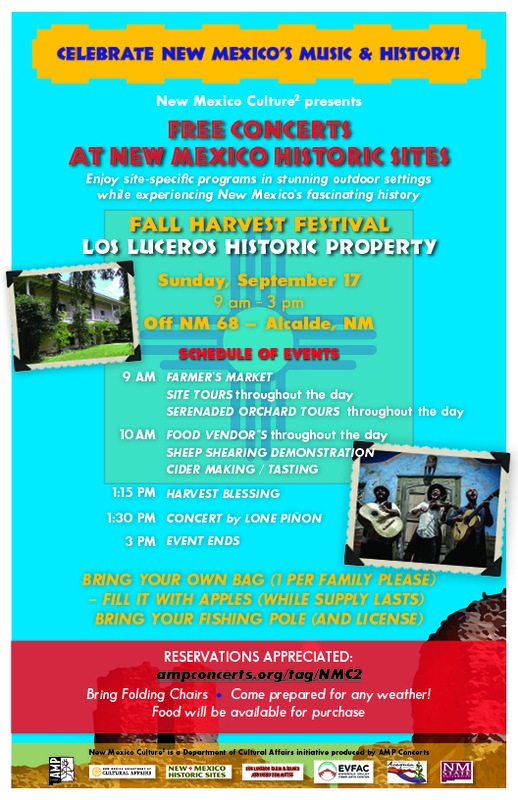 "La Sabiduria del Agua: Stories of Enduring Acequias"
Join the NM Acequia Association for the 2nd Annual Los Luceros Harvest Festival! Free Music, Beer Garden, Hard Cider and MUCH MORE!! Meeting the people of New Mexico and learning about their agricultural legacy has been a goal of New Mexico State University’s dean of the College of Agricultural, Consumer and Environmental Sciences. Dean Rolando A. Flores began his second year at the university with a week and a half long tour of Northern New Mexico, including establishing a satellite office at the Sustainable Agriculture Science Center at Alcalde. Flores met with farmers, ranchers and Native American tribal leaders to learn about the agricultural challenges, and to hear what they think the NMSU College of ACES can do to help them. A reoccurring concern was the lack of young people wanting to continue the tradition of farming. While visiting an organic vegetable farm in Santa Cruz, Flores saw how one farmer is successful while cultivating a piece of land that has been in his family for 400 years. He visited with leaders of the New Mexico Acequia Association to learn about their issues associated with delivering water to the farmers in the Rio Grande Valley. Flores meet with the leaders of the Jicarilla Apache Nation and the pueblos of Cochiti, Santo Domingo, Santa Ana, Acoma and Santa Clara, as well as the Institute of American Indian Arts President Robert Martin. “I learned about the various agricultural programs and the opportunities for us to work closer with the Native American communities,” Flores said. Flores plans to maintain the satellite office at the Alcalde research farm. Who Is Liable for Flood Damage? Ideally the Mayordomo/a checks out the situation, and does what they can to divert the flow of water to the proper place, or stop the flow of water and access the situation. Headgates get opened or closed, repairs may be made or scheduled, possibly a parciante is warned to not let the water go onto a neighbor’s property . . . The homeowner is coached on how to manage the situation. If there has been damage to someone’s property what is the acequia to do? Despite all the care we give to the acequia a plethora of mishaps can cause unintended damage and drama. We can attempt to play peacemaker and apologize to the person who is affected, but at the end of the day all parties must understand that under NM law the acequia will not be held liable. Any homeowner who could be affected by acequia flooding should take precautions (this could mean building a berm etc.) and avoid building in an area that would be vulnerable to flooding. All of us who move the water must exercise caution and wisdom when irrigating but if a parciante is willfully or intentionally flooding a neighbor’s property, this is a separate matter. Back to the acequia’s liability. If someone threatens a tort claim against the acequia here is what you should know: A tort means a breach of a duty owed by one person or entity (the acequia) to another. The legal way of addressing the claim is usually collecting damages, i.e. the money claimed by a person as compensation for the loss or damage resulting from the breach of duty. Acequias and their officers, employees, and volunteers are generally immune from most tort liability (though there are a many circumstances and facts of the situation to be considered). Even if damages or injury can be proven, and even if the acequia was negligent, the Tort Claims Immunity Act prevents the acequia from being held liable. What should the Acequia do when we are being sued? Anyone can sue, but can they win? If the acequia is being sued, consult with a lawyer immediately and raise the tort claims immunity defense. There is one important exception to acequias being shielded from tort liability: a tort caused by the negligent use of a motor vehicle while acting within the scope of their duties. In addition to this exception, acequias and their officers or agents may also be responsible for a wide variety of non-tort claims that may give rise to damages, penalties, and other sanctions imposed on them for failure to comply with the law. An acequia that is being sued and is unsure whether the claim is the type of claim covered by the Tort Claims Immunity Act, should seek legal counsel. Acequias that anticipate frequent or substantial use of a motor vehicle should contact the Risk Management Division of the State’s General Services Department and inquire about obtaining liability insurance. Acequias may also want to ask about other types of coverage generally. If a landowner raises concerns of being flooded, it is important to inform them of their need to protect their own property, while still doing everything we can to ensure the acequia is functioning smoothly.